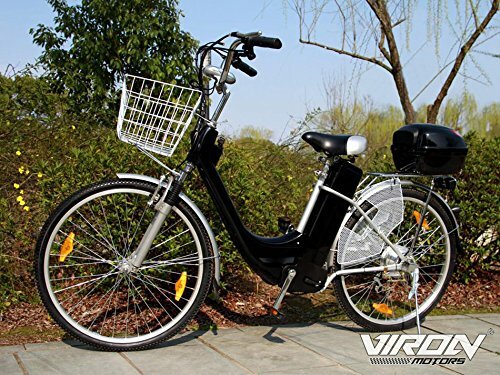 The electric bicycle comes with a brushless 250-watt electric motor. The 36-volt battery pack with 12 Ah supports a range of up to 60 km. Thanks to the easy-to-remove battery pack, the bike does not need to be charged directly. In addition to the LED front headlamp and rear LED light, this model features an electronic horn. The height-adjustable comfort seat and the ergonomic hand grips ensure a comfortable ride even over longer distances. The 6-speed SIS Shimano gear shift also makes large inclines easy to tackle. In the front, there is a basket that is great for transporting small amounts of shopping. What's more, the bike has a lockable TopCase, which can be attached to the top of the pannier rack. Spoke protection on both sides prevents clothing from becoming trapped in the rear wheel. Engine: 250 watts / 36 volts. Drive type: rear wheel drive – brushless. Battery pack: 36 V / 12 Ah – lead gel. Charger: 220 / 110 V – 50-60 Hz. Front brake: V-brake braking system. Tyre dimensions: 26 x 1.75. Dimensions (L x W x H): 188 x 116 x 63 cm. Saddle height: adjustable (86 to 96 cm). Weight without battery: 26 kg. Weight (including battery): 40 kg. Motor: 250 Watts / 36 Volts - brushless. Other details: Includes UK compatible charger, comfort saddle, basket, top case, LED light, rear light.